Schneit es monentan in Hakuba Goryu ?Vielen Dank! Heavy rain (gesamt 52.0mm), heaviest währ. Mittwoch abend. Warm (maximal 21°C am Dienstag morg., min 7°C am Montag abend). Wind will be generally light. Heavy rain (gesamt 22.0mm), heaviest währ. Freitag abend. Freeze-thaw conditions (maximal 13°C am Donnerstag abend, min -2°C am Samstag abend). Wind will be generally light. Die Table oben zeigt die Wettervorhersage für Hakuba Goryu auf der angebebene Höhe von 950 m. Unsere ausgeklügelten Wettermodelle ermöglichen uns die Schnee-Vorhersage für die Gipfel-, Mittel- und Bodenstationen für Hakuba Goryu. Das Fenster über der Tabelle ermöglicht das Abrufen der Wettervorhersage für andere Höhen. Für einen umfassenderen Blick auf das Wetter, siehe die Wetterkarte" von Japan. 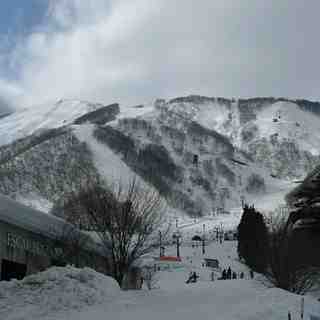 I skied in Hakuba Goryu in Jan 09 and liked the place so much that we will return in Jan 12. The benefit over the Hokkaido ski resorts is that you can get there directly from Tokyo via surface transport. We used the Shinkansen (bullet train), which was a holiday highlight in itself! It snowed non-stop for six out of seven days that we were at Hakuba. We had between 20-50cm of fresh snow every morning. On the one bluebird day, we saw the Hakuba Alps for the first time. This gives a true European feel to the place than the other Japanese resorts. Lift queues are totally non-existent and the resort staff very courteous, as only the Japanese can be. We also found the terrain had great variety with good skiing for all levels of ability. We stayed at the largely Australian run AquaAlpine hotel. It is lovely modern accommodation with very personalised service. The hotel has a cozy central bar and fireplace area. The architecture of the place is also impressive. A great place for a Sapporo Lager after a day in the snow! The Hakuba Goryu apres scene certainly can't be compared to Niseko, however, there are still some good bars and restaurants to be found. We really enjoyed CanadaThai - strange name for a traditional Japanese restaurant! There are two drawbacks to Hakuba Goryu. Firstly, there aren't a huge number of ski in / ski out hotels, which meant a walk up the hill to Escal Plaza every morning. Not a problem for me in snowboard boots, but the skiers didn't enjoy it. We found it better to leave our ski gear in lockers at the Plaza (at a small cost) and change when we got there. My second point is one you probably have already heard before - the ban on off-piste skiing in most resorts in the region. Hakuba will not compete with the North Island resorts unless it applies a more practical approach to this issue. I guess it's like the prohibition analogy, people will do it anyway so it is better that you authorise it in areas that can be supervised and controlled. 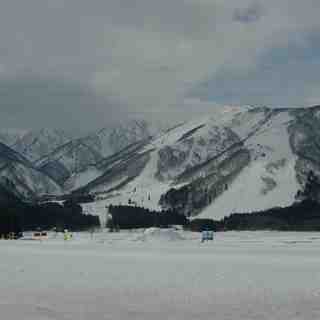 All in all, Hakuba is a great ski resort. I strongly recommend that you have a look at it, as an alternative to Niseko. Lesen Sie 2 andere Beurteilungen ueber Hakuba Goryu oder geben Sie Ihre eigene Bewertung ab. Das Hakuba Goryu Skiwetter Wideget unten, ist auf externen Seiten kostenlos eigebettet. Es bietet eine tägliche Zusammenfassung über unsere Hakuba Goryu Schneevorhersage und derzeitige Wetterbedingungen. gehen Sie einfach auf die Feed-Konfiguration Seite und folgen Sie den 3 einfachen Schritten, um den eigenen HTML-Code-Snippet zu packen und fügen Sie ihn auf Ihrer eigenen Website. Sie können die Höhe der Schneevorhersage wählen (Gipfel, mittel Berg, oder unterer Gipfel) und Messeinheiten metrisch / Schneevorhersage für den Feed auf Ihre eigene Website & hellip anpassen; Klicken Sie hier, um den Code zu bekommen.